Our December has been jam packed, as I'm sure it has for most people! I can't quite believe it's over, and that we are welcoming in the new year already. It's been a lovely month where we celebrated my birthday as well as Christmas, and spent a lot of time together as a family. I wish I'd captured more on camera, but at least I've got the happy memories to remember. The first weekend of December saw us putting up our Christmas tree which this year was a small number shoved into a corner so that a certain someone wouldn't destroy it. Zach absolutely loves our tree when it is all lit up. He beams at it with his little toothy grin and waves with excitement. He may be too young to understand what Christmas is all about but he has definitely been swept up in the merriment. For my birthday we headed to London for the day. After a quick stroll around Winter Wonderland we headed to the toy department in Harrods which Zach absolutely loved. We let him play with the toys and he had so much fun pushing around a pushchair. We ended up staying there for well over an hour! I headed back to London the next day with my best friend Louise who had organised a surprise trip to see Elf the musical! We shopped, chatted, drank cocktails and felt so festive after watching the show. 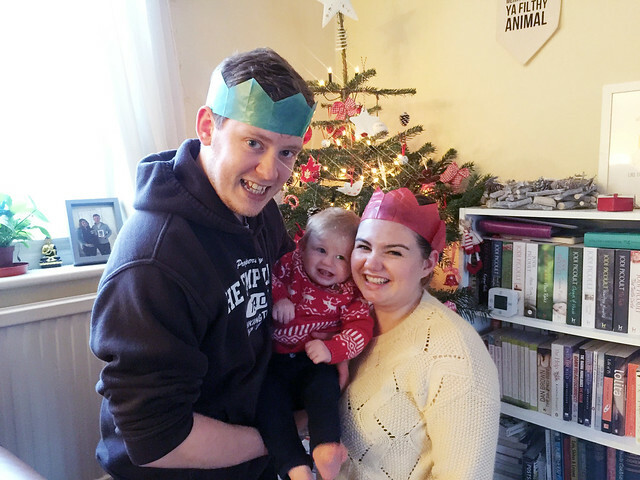 Christmas is never just one day in our house, and we celebrated from Christmas Eve right up to the bank holiday Monday. Zach was an absolute star and was the happiest little boy in the world. Although he didn't understand the concept of opening presents he loved all of his new toys and was absolutely spoiled rotten. Now we just have to find a home for everything! 2015 has been an amazing year for us. It was the year that Zach was born and we became a family, and I don't know how we are ever going to top it! Although I am sad that it's come to an end I'm excited to see what 2016 brings!